Jakarta, September 22nd 2014 – Indonesia's pioneering hotel management company, Archipelago International, is once again expanding its successful Aston brand. 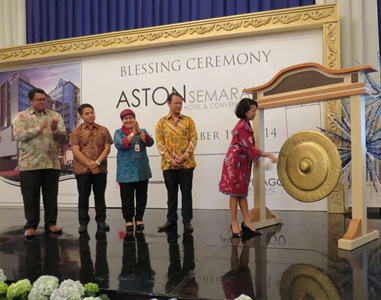 Today opened, the Aston Semarang Hotel & Convention Center which is the first Aston hotel in Semarang, Central Java. The Aston Semarang Hotel & Convention Center is conveniently located on Jalan MT Haryono, right in the heart of Semarang and close to the historic Kota Lama (Old City) and Pecinan (Chinatown). Nearby, guests can also enjoy easy access to Semarang's business district, shopping mall, train station and airport, making it a perfect spot for meetings and social activities alike. Semarang is the capital and largest city of the Central Java province. It’s a bustling, mid-sized city with a population of 1.5 million and its own charm of contrasting architecture. Mid-rise buildings merge with Dutch colonial architecture and culturally-rich Chinatown just against small “kampongs”. The Aston Semarang Hotel & Convention Center is a luxurious 4-star business and conference hotel offering 157 guest rooms and suites. The hotel also boasts an all-day restaurant, Jade Café & Resto on third floor, the elegant Mezzanine Lounge and Bar as well as recreational facilities including an outdoor swimming pool, a well-equipped gym and a full service spa. For business guests, the hotel’s modern conference center features a ballroom that can accommodate up to 900 guests alongside 8 auxiliary meeting rooms. 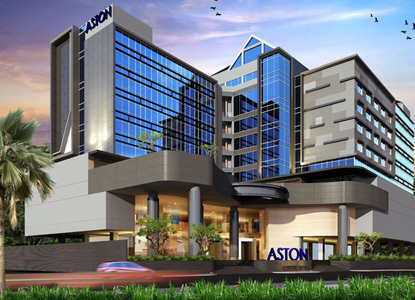 “We are very excited to expand our Aston brand to Semarang after the successful introduction of our other hotels, Quest Hotel Semarang and Hotel NEO Candi Semarang. Semarang is a beautiful destination and a real up-and-coming tourist haven. Aston Semarang Hotel & Convention Center is now ready to accommodate both business travelers and leisure tourists alike, whether they are visiting Semarang for a MICE event or to explore this exciting city.” Said Norbert Vas, Archipelago International's VP Sales & Marketing. Exterior of Aston Semarang Hotel & Convention Center, Semarang - Central Java. Blessing ceremony of Aston Semarang Hotel & Convention Center Ceremony, Seen in the picture from left to right Mr. Yanuar Dedy Setyawan as Corporate Sales & Marketing Director of Archipelago International, Mr. Berri Naurika as General Manager of Aston Semarang Hotel & Convention Center, Mrs. Masdiana Safitri SH as Head of Culture and Tourism Semarang, Mr. Ali Budiono as owner of Aston Semarang Hotel, Mrs. Dra. Hj. Ayu Entys WL, MM as representative for Mayor of Semarang.